Computer guided surgery, with the aid of modern and increasingly sophisticated software, enables the surgeon to plan the operation by means of a computer program, step by step, starting from a proper dental CT scan. Once we have the 3D CT scan of the dental area to be treated, this scan will be imported into a highly technological software program which will elaborate 2/3 dimensional anatomical structures, enabling us to carry out a virtual computer simulation, planning the implant placement and prosthetic structure, precisely to a tenth of a millimeter. This simulation allows us to provide every detail of a virtual operation, avoiding areas of surgical risk, respecting axes and optimal inclinations according to the quantity and quality of bone available, and then virtually position the teeth as the initial plan of intervention. All this can be revised over and over again until they reach the desired result. Once the planning phase is completed, the project will be concluded and the file generated by a program in Sweden will be e-mailed, to Gothenburg, where specialized laboratories of Nobel Biocare will create a specific surgical mask in short time. This mask will be placed in the patients mouth, allowing the surgeon to insert the implants exactly as designed on computer and, in addition, without having to resort to incisions and stitching. Other additional advantages of this method is the possibility to prevent surgical risk, the speed of this operation and rehabilitation period of the patient without the impact characteristics of traditional techniques. This method is used by us for planning and placement of implants and All-on-4™ protocols in our surgeries when there are signs of such need, also the NobelClinician / NobelGuide software which allows to diagnose, plan the placement of an extremely accurate computer guided implant. 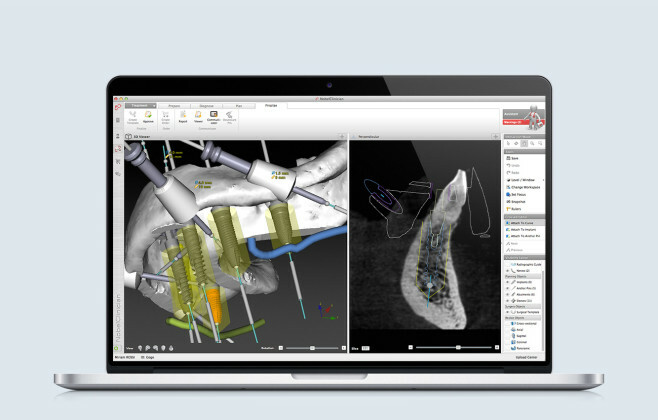 NobelGuide software allows us to perform a detailed diagnosis such as the identification of available bone, the buffer zones and/or those at risk, as well as the virtual implant placement according to the anatomical condition and prosthetic needs and finally to order a customized surgical mask and everything needed for the actual operation itself. NobelGuide supports less invasive flapless techniques as well as surgical access through mini side-supports and full-supports, while the surgical mask ensures accurate, guided positioning. For years our firm has been engaged in multi-centered and international research on the development of these technologies for a scientifically serious partner as Nobel Biocare, for which Dr. Benzi has carried out a research protocol for man’s evaluation on ‘Accuracy of “NobelGuide / NobelClinician” Guided Surgery. What are the disadvantages or risks in this approach? It should be clear from the beginning that it is not always possible to use Computer Guided Surgery. The technique requires instrumentation and Utilities (Surgical Guide) that have accessory costs, but which are sometimes compensated by time reduction of the operation. The use of this new technology is not dangerous, on the contrary, in many cases, it enables us to intervene with high degree of safety in situations that would be at high risk if operated “by hand”.